I hadn't forgotten how great “Ali: Fear Eats the Soul” (1974) is, but it sure is nice to be reminded every now and then. Absurdly prolific German dynamo Rainer Werner Fassbinder had a little down time in between films so, of course, he used the time to shoot another film, just a “little” project he knocked off in about two weeks. Which is actually longer than many of his earliest films took to shoot but, hey, he was closing in on thirty (though he had already squeezed in about three hundred years worth of living). It was the seventeenth feature he'd shot since his 1969 debut “Love is Colder Than Death” (1969) and though nobody would have suspected it at the time, it would come to be viewed by many, including yours truly, as one of his masterpieces. Emmi Kurowski (Brigitte Mira), a dowdy sixty-something German cleaning lady, enters a rundown bar to dodge a sudden rainstorm. She is greeted by the indifferent stares of its denizens, posed motionless across the room in one of those frozen tableaux Fassbinder loved so dearly. Emmi has survived a war, a husband, and a ragged economy so she calmly sits down and orders a Coca-Cola. As the locals continue to eye her suspiciously. Accepting a cynical dare, bar regular Ali (El Hedi ben Salem), a handsome thirty-ish Moroccan immigrant, asks Emmi to dance. She demurs at first (it's been more than twenty years, after all) but eventually accepts and in just a few minutes it's as if they've known each other forever. Societal oppression initially unites the couple, but then the film pulls off a clever switcheroo. After the newlyweds escape on a delayed, low-rent honeymoon, they return home to find they are suddenly accepted by their former persecutors. This is Fassbinder's world so this unexpected kindness is soon revealed to be motivated exclusively by need: a racist shopkeeper realizes he needs Emmi's business, her son needs a free baby-sitter, a neighbor needs Emmi's storage space in the cellar. But you take what you can get. The film isn't as ornate as a Sirkian Technicolor fantasia or as later Fassbinder films like “The Marriage of Maria Braun” (1979), but Fassbinder's staging is much more meticulous than in his early rough-and-tumble productions. 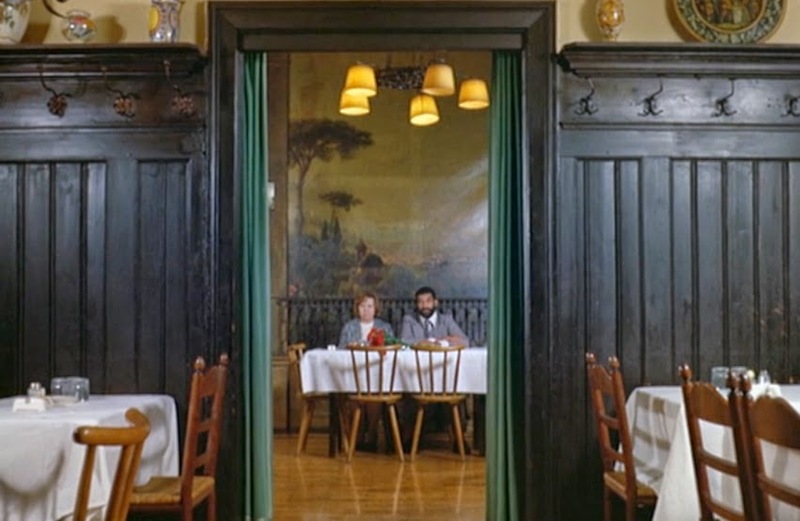 Emmi and Ali (sometimes together, sometimes alone) are often framed through doorways or glimpsed in mirrors (of course mirrors, this is Fassbinder by way of Sirk), sometimes as tiny figures in the distance with empty space taking up much of the foreground. Emmi and her neighbors and co-workers usually interact while traversing stairways, enabling them to be both close and distant in the same scene, above or below each other depending on how the interaction proceeds. Fassbinder viewed every relationship as a constant power struggle and isn't content to portray Emmi and Ali merely as pure, star-crossed lovers. Emmi views her new man as an exotic catch and showcases him to jealous friends, expecting him to perform on command. They are both well aware that Emmi wields all the control as far as German society is concerned; most pointedly, she keeps calling him Ali though he explains he only answer to that name because Germans refer to all Arabs as Ali. Ali, in turn, strays when Emmi doesn't fulfill his immediate needs and, in one of the movie's most devastating scenes, he laughs loudly when one of his fellow auto mechanics taunts Emmi about her age. 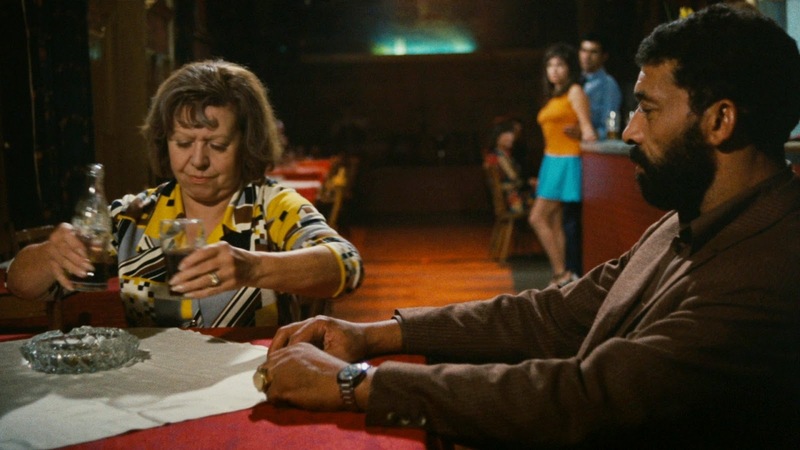 Mira, a veteran actress, and ben Salem, Fassbinder's lover at the time and a first-time lead actor, are both magnificent though ben Salem's performance is also created in no small part by uncredited voice-over actor Wolfgang Hess. Each of the lovers projects an aura of vulnerability that binds them together. They are often gentle, sometimes cruel, and absolutely meant to be together while also quite obviously doomed from the start. That's about as optimistic as Fassbinder could get about love. It all works. Every line. Every shot. Every cut. Emmi and Ali are the greatest couple in movie history and I think about them often. 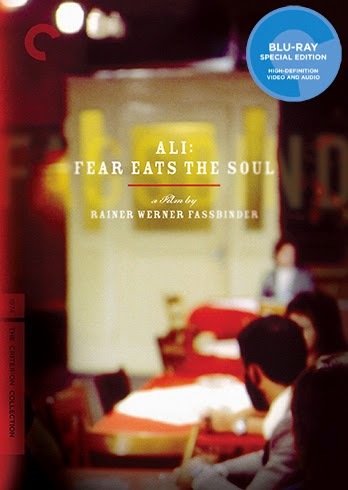 I've seen “Ali: Fear Eats the Soul” at least ten times and I admire it more with each viewing. The film is presented in its original 1.37:1 aspect ratio. Colors are richer than on the 2003 Criterion SD release but they are still somewhat muted though reds occasionally flourish. Image detail is very sharp, as expected, and a thick grain structure is well-preserved and very pleasing to the eye. There hasn't been any significant restoration done and there are still a few minor instances of damage or debris visible, but nothing that really matters. The linear PCM mono track is fairly modest. Some viewers might be a bit distracted by the ADR work as voices sound somewhat disembodied and a little loud at times, but Wolfgang Hess does such a fantastic job as Ali's voice I think this element is really a strength of the movie. Optional English subtitles support the German audio. Criterion has imported all of the extras from the 2003 SD release. Todd Haynes's “Far From Heaven” (2002) was a remake of sorts of “All That Heaven Allows' by way of Fassbinder so he makes a natural interview (23 min.) subject for this disc. Haynes is in full film studies mode as he discusses Fassbinder's work and his relation to Sirk. The disc also includes a 2003 interview with actress Brigitte Mira (23 min. ), still sharp at 93 (she died in 2005) and not shy about promoting herself either. She talks about working with Fassbinder and ben Salem, We also get an interview with Thea Eymesz (22 min.) who edited or co-edited more than a dozen Fassbinder film. Eymesz was a creative force on Fassbinder's movies but not part of his cult-like inner circle so she provides a fresh and valuable perspective; it's hard to believe Fassbinder gave her as much control as she claims, though. “Signs of Vigorous Life” (32 min.) aired on Feb 12, 1976 on the British series “Omnibus.” The TV special spotlights several New German Cinema directors (including Werner Herzog and Wim Wenders as well as Fassbinder and others). I wish it was better and that the presenter didn't spent ¼ of the running time repeating over and over how much post-war German cinema totally sucked. Film clips are replaced by stills for copyright reasons. The disc also includes an excerpt from Fassbinder's “The American Soldier” (1970) in which actress Margarethe Von Trotta delivers a three-minute monologue about a cleaning lady named Emmi and an Arab man named Ali who fall in love and end up in tragedy. A reasonably diverse collection of extras, but nothing that really packs a punch, unfortunately. The slim fold-out booklet includes an essay by author Chris Fujiwara.